caster may be adjusted by using wedges or shims, eccentric cams, or adjustable struts. Negative caster (fig. 8-48) tilts the top of the steering knuckle toward the front of the vehicle. With negative caster, the wheels will be easier to turn. However, the wheels tend to swivel and follow imperfections in the road surface. Positive caster (fig. 8-48) tilts the top of the steering knuckle towards the rear of the vehicle. Positive caster helps keep the wheels of the vehicle traveling in astraight line. When you turn the wheels, it lifts the vehicle. Since this takes extra turning effort. the wheels resist turning and try to return to the straight-ahead position. 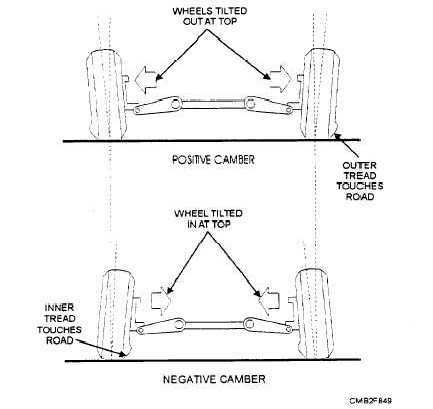 Positive and negative camber (fig. 8-49) is measured from the true vertical (plumb line). If the wheel is aligned with the plumb line, camber is zero. With positive camber, the tops of the wheels tilt outward when viewed from the front, With negative camber, the tops of the wheels tilt inward when viewed from the front. Most vehicle manufacturers suggest a slight positive camber setting from a 1/4 to a 1/2 degree. Suspension wear and above normal curb weight caused by several passengers or heavy loads tend to increase negative camber. Positive camber counteracts this. Toe (fig. 8-50) is determined by the difference in distance between the front and rear of the left and right side wheels. Toe controls whether the wheels roll in the direction of travel. Of all the alignment factors, toe is the most critical. If the wheels do NOT have the correct toe setting, the tires will scuff or skid sideways. Toe is measured in fractions of an inch or millimeters. Figure 8-49. - Camber angle.